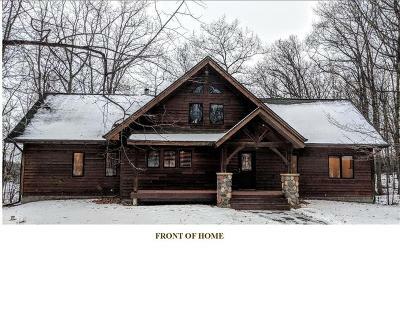 Custom built timber frame home built on 1.6 Acres heavily wooded Sand Lake lot. Over 2200 feet of Open concept living space with Hardwood floors throughout. Wood fireplace and loads of windows looking out to a large deck. Baker’s kitchen with granite counter-tops, custom cherry cabinets and a center island. Loft overlooking the living area. 3 bedrooms on main floor including a large owner’s suite with whirlpool tub located on the East wing of the home offering great privacy. Walkout lower level has a large family room, 4th bedroom and an area just waiting for finishing touches to offer another 1100 plus feet of living space to suit your needs. 2 Car garage with finished area above for overflow or spouse cave purposes. Over 150 feet of hard bottom swimming frontage.